Why do Paleo/SCD/Grain Free Alone? Starting out on any diet can be difficult, but if you’ve committed to following an AIP diet, you’re on this journey for a reason. You may be trying to reset or support the growth of healthy bacteria in your gut, or perhaps you’ve already experienced that the AIP diet has helped reduce your symptoms of Crohns, Lupus or other autoimmune diseases. Whatever your reason, you’ve most likely discovered both the advantages and the challenges of the AIP diet. While the advantages are plentiful, the challenges can be difficult to overcome; namely the challenge of finding the time to cook meals that comply with AIP restrictions. It isn’t difficult to find ingredients and recipes that follow the AIP diet, but finding the time to prep for and cook AIP meals 3 meals per day, 7 days per week can be challenging – especially if you lead a busy life. And because the AIP diet requires that you not only cut out grains, dairy, and legumes but also nightshades, eggs, nuts, seeds, and alcohol, it can be difficult to find pre-made, AIP compliant meals. But it’s not impossible! In fact, there are a number of online companies who will craft and deliver AIP compliant meals straight to your door, no matter where you live. What we’ve aimed to do in this article is provide you with a wealth of resources that can help you maintain your AIP lifestyle. Read on to learn about the companies we’ve discovered who create AIP delivery meals. It may come as no surprise to you that there are companies online who specialize in creating home-cooked meals for any number of restrictive diets (Paleo, Whole30, clean eating, etc). As AIP is often considered an offshoot of the Paleo Diet, many companies that specialize in creating pre-cooked, Paleo-compliant meals will often offer a line of meals that follows the AIP protocol. This is great news for anyone interested in keeping frozen, AIP-compliant meals at home. Keeping AIP freezer meals on hand can help take a lot of the stress out of a busy day. Whether you’re interested in keeping a few meals in your freezer or purchasing a month’s worth of fresh/refrigerated AIP meals, there is an option for you out there. The companies that we’ve listed below are all companies that offer AIP friendly meals or meal plans delivered anywhere in the US, straight to your door (home, work, it doesn’t matter!). If you’re interesting in getting some support with your weekly and monthly AIP meal prep and planning, check out the AIP food delivery services we’ve compiled below. This post contains affiliate links. Thank you for supporting us! Click here to learn what this means. If you’re interested in AIP meals, Paleo on the Go is a great choice as they specialize in AIP food delivery. While there are several companies who offer AIP options, Paleo on the Go has an extensive AIP menu and a large AIP meal plan. The founder of the company has attempted to follow the AIP diet to help himself heal from his own health issues so he knows what it’s like for those on the AIP. If you’re interested in keeping a few emergency meals on hand, you can order their meals a la carte. If, on the other hand, you’re interested in ordering a full month of AIP compliant meals, Paleo on the Go has meal plans specifically for the AIP diet, with meal options like AIP pot pies, brisket, and mojo chicken wings. The company is meticulous in its sourcing and maintains close relationships with their vendors, and if you’re concerned about where your food is being sourced from, you can examine their list of vendors. For extra piece of mind, all their meals are made in a dedicated gluten-free commercial kitchen. Paleo on the Go offers delivery nationwide so no matter where you live in the U.S. they will deliver to you. See paleoonthego.com for prices and current Paleo on the Go AIP menu items. Note: Paleo on the Go is offering a 10% discount for our readers, use code “MYPALEOS” at checkout for 10% off your entire order – one time use. Although they recently changed their name to True Fare from Pre-Made Paleo, the emphasis on Whole30 and Paleo compliant meals has not changed. True Fare has put together a subset of their menu specifically for those on the AIP. Since they create only Whole30 approved meals, even their AIP plan, designed for the elimination phase of the AIP, follows the tenets of the Whole30 diet. No matter the meal you purchase, you can be sure that the produce being used in their meals is organic. Like Paleo on the Go, True Fare offers customers the option of purchasing a la carte items or choosing from a 5 or 10-day AIP meal plan (menu options have included pesto chicken, breakfast skillets, or turkey meatballs and organic broccoli soup). True Fare also offers hard-to-find proteins, and they have specific, AIP friendly options like wild-caught sea bass and water buffalo breakfast sausage. If you’re interested in fresh meal delivery (as opposed to frozen) True Fare offers a fresh option alongside their more economical frozen delivery option. Like Paleo on the Go, True Fare offers nationwide AIP meal delivery. Caveman Chefs is a company that operates out of Colorado and uses local vendors and proteins to create globally inspired meals. Like Pete’s Paleo, they require that customers purchase a meal plan, but their plans vary in size and are customizable. Caveman Chefs will work with customers to make sure that their meals are compliant with all different kinds of diets. Customers can select the AIP option when choosing their meal-plan/dietary preferences. Caveman chef customers are often drawn to the wide variety of interesting proteins offered (like New Zealand lamb!). While the company offers several pickup locations (which are convenient if you’re local to Denver), they also ship nationally. Caveman Chefs has offered 10% off all Caveman Chefs orders by mentioning the promo #ZachmyPALeos in the order comments or mentioned by phone during checkout. 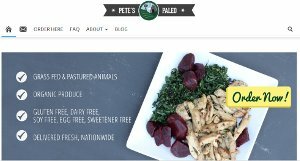 Pete’s Paleo maintains a kitchen on both the east and west coasts of the US and prides itself on using only in-season produce from local vendors. Pete’s menu rotates constantly, depending on what produce their vendors offer. 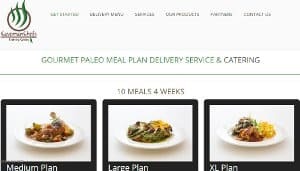 While Pete’s Paleo only offers meal plans, and their main plans focus on Paleo meals, they do have an option for customers who follow an AIP diet. If you want, you can create your own five-meal meal plan from their “Eat What you Love” section. Here, they have AIP meal options (as well as options for customers following ketogenic or low FODMAP diets). Their meal options are creative and enticing (basil chicken with chive spaghetti squash and Swiss chard; black pepper tenderloin with golden beats and sautéed spinach), and all meals ship free. 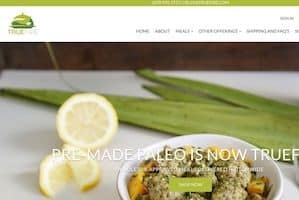 While the companies we’ve listed above have specific menu options and meal plans for the AIP diet, there are also plenty of other companies that create Paleo dishes that meet AIP requirements. Below, we’ve listed companies who focus on creating Paleo-compliant meals. While these companies don’t have specific AIP menus, many of their meals work well with an AIP diet. They allow customers to see exactly which ingredients are used in their meal prep, which means you can make informed decisions as to whether or not their meals work for you. Like the companies listed above, these companies ship nationally. Before they were The Good Kitchen, they were ModPALEO and they had a dedicated AIP menu. When they rebranded their company as The Good Kitchen, they did away with their strict AIP menu and focused, instead, on Paleo meals. While their meals are not labeled as such, they typically offer a few AIP friendly dishes each week. To figure out whether a meal is AIP compliant, click on each meal under the Get Started section. You can see all of the ingredients used in each meal so The Good Kitchen is a great option if you have your own unique dietary requirements. Meals are made with 100% grass-fed and grass-finished beef, pasture raised poultry, eggs, pork and Seafood Watch compliant fish and seafood. They have partnered with local organic and sustainable farmers in their area (Charlotte NC region) to source ingredients for their meals. The Good Kitchen has a weekly rotating menu – often impacted by what ingredients are available from their local vendors. 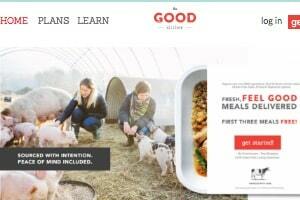 All orders from The Good Kitchen ship free. Although there are several meal plans offered you also have the option of ordering from their custom plan which has a one-time option – allowing you to order as few as 5 meals and still receive free shipping (great if you want to just try out the service). The Good Kitchen is offering a 15% discount for our readers. Use promo code “mypaleos” at checkout for 15% off your first order. Trifecta brands itself as a meal-delivery plan geared towards helping people with their fitness goals. They don’t offer an AIP plan, but they offer Paleo, clean eating, and vegetarian plans. 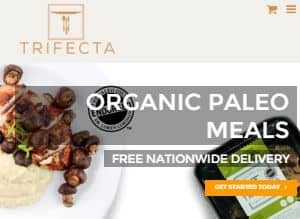 What Trifecta offers that none of the other sites do, however, is an a la carte plan that allows you to order ingredients in bulk. This could be a good option for people in an AIP diet. You can get bison burgers, ahi tuna, and mixed vegetables in bulk – this way you can easily put together meals yourself. All items on their a la carte menu come pre-cooked and lightly seasoned (in general this means salt and olive oil but you likely will want to confirm for the specific item you are ordering). The food is humanely raised and organic, and putting your own meals together from Trifecta’s a la carte page is one of the more economical options for meal-creation ($6.90 a meal, based on their math). Like The Good Kitchen, Trifecta will ship anywhere in the US for free. For those who are struggling to manage their health conditions and want to change their diet as a way to do so, following an AIP plan can be central to your success. We sympathize with the challenges that come with following AIP diet, especially if you have a busy schedule, but this doesn’t have to prevent you from maintaining your balanced life, even during the elimination stage. Ordering from one of the AIP meal delivery services in this article can help take some of the burden off you when planning out your daily routine. Many of these companies also offer packaging that is conducive to travel (if you’re visiting family, or heading out of town for work). One great option if you are planning a trip somewhere within the U.S. is to order a care package for yourself of prepackaged AIP delivery meals. This way when you arrive at your destination, you don’t have to focus right away on locating AIP friendly shopping options and start cooking meals right away and you’ll still have something to eat those first few days. Many hotels now offer you to request a mini-fridge or microwave, enough to reheat these meals. Staying in a vacation rental or Airbnb are always great options as they typically include at least a small basic kitchen. You might even use these AIP meal services as a way to take a vacation from cooking or to supplement your cooking during busy periods in your life. Starting on a new diet, especially one with as many rules as Autoimmune protocol or Paleo AIP can be overwhelming. When learning the ropes on how to cook and source the ingredients for these meals, it can be helpful to not have to cook all meals yourself in the beginning. Sometimes when you are just starting out on the diet it can, for example, make life easier to buy AIP bone broth than learning to make the bone broth and then use it as a base for your other dishes, not to mention finding high quality beef, poultry or fish bones to use. 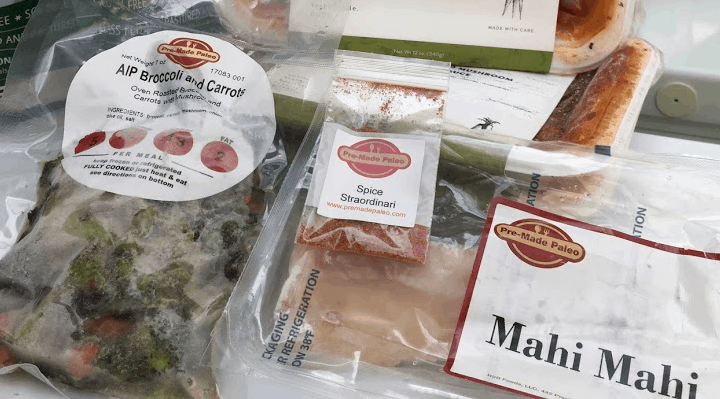 Several of the Paleo AIP meal delivery companies in this article, such as Paleo on the Go covered above, offer frozen bone broths made with grass-fed beef and pastured poultry bones. It can often be hard to find the same level of ingredients used by the companies above specializing in AIP and Paleo even at your local health food store, co-op or Whole Foods. You would likely need to visit multiple farmers markets. Depending on where you live and the season, may not be feasible to pick up all of the ingredients you need for the week. These companies partner directly with farms dedicated to grass fed, grass finished and pastured proteins and with local farms in their area for in-season organic sustainable produce. They plan around what is available in each season when crafting their menus and – often are located in areas of the country where a decent amount of variety of local produce is available at all times of the year (even if it is more root vegetable heavy in the winter time for example). The AIP paleo meal delivery services covered in this article all ship their meals vacuum sealed and ready to re-heat, so they are pretty convenient even with limited kitchen facilities. As long as you have access to a refrigerator and a microwave or stove you are able to heat up the AIP prepared meals whenever you are hungry! I often take advantage of the autoimmune Paleo meals I’ve ordered by bringing them to the office with me as my lunch. Most workplaces have a microwave to heat up meals. If you choose an AIP meal delivery service above that packages their meals in TV dinner style shrink-wrapped packages, the process is very similar to what other people might be heating up for lunch at work. As an example of a company that provides frozen meal style vacuum sealed TV dinner style trays, look at the AIP meals from The Good Kitchen above. Whether you wish to supplement your home cooked meals with a few pre-made meals, or stock your freezer with a month’s worth of AIP catering, there are options available to you. We hope that at least one of the autoimmune Paleo meal delivery options listed above might work with your lifestyle. If you’ve found an AIP diet meal delivery service you love, or if you know of any of other nationwide AIP friendly companies, write us a note in the comments section! We’d love to hear what you have discovered – it will likely help others here on their healing journey. Note: If you are combining the AIP with either the Specific Carbohydrate Diet or GAPS diets intermittently to help control your autoimmune disease, we have also created a guide tailored to SCD meal delivery as well. We also have articles on related topics such as Paleo and AIP frozen meals, AIP meal kit delivery, AIP fast food and AIP meals available in local cities, such as our Paleo & AIP food delivery Los Angeles guide, AIP meal delivery NYC guide and Paleo AIP NYC restaurants guide and Denver AIP Paleo restaurant guide. Hi, I'm Zach. The Paleo and SCD diets have been life changing for me. My goal is to help others in the transition to grain free diets such as the Paleo, Primal, SCD or GAPS diets. I hope to build a community of support similar to what I wished I found when I started my own diet journey with SCD and Paleo. Why go through it alone when we can support each other? Can the Paleo Diet Reverse Heart Disease? Is Frozen Fruit Paleo? Whole30 Approved? Keto Friendly? Is Trader Joe’s coconut milk Whole30 compliant? Is it Keto? SCD? Are Terra Vegetable Chips Paleo? What about Whole30? Keto? Are Olives OK on Whole30? What about Black Olives? Manzanilla? The material on this web site is provided for educational purposes only and is not to be used for medical advice, diagnosis or treatment. Readers should not act upon any information provided on this Website without seeking advice from a licensed physician. This Website is not intended to create a physician-patient relationship between us and any user of this Website. Please see our full terms and conditions policy here.